Did you know that for each dollar donated to World Vision, more than a dollar’s worth of help gets to children and families? We’re always working to keep our overhead rate low. 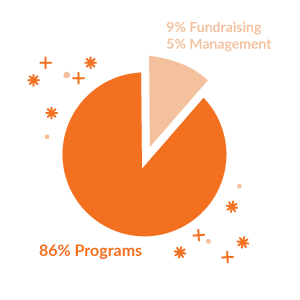 In 2018, we used 86 percent of our total operating expenses for programs that benefit children, families, and communities. Overall revenue grew 1% in fiscal 2018, expanding our ability to tackle the root causes of poverty. This revenue increase, combined with improved efficiencies throughout the organization, produced an increase in net assets from operating activities of $12 million. World Vision reports joint cost activities on the Financial Statements and the Form 990 as required by Generally Accepted Accounting Principles and the IRS. The allocation of these costs appropriately follows the guiding principles for reporting activities that have components of Fundraising, Management and General, and Programs. Activities with a joint cost component occur in our Donor Contact Center as well as in our 30 Hour Famine program. Operating revenue for the organization increased by 1% during the year. Public grants and gift-in-kind revenue increased while private cash revenue decreased. 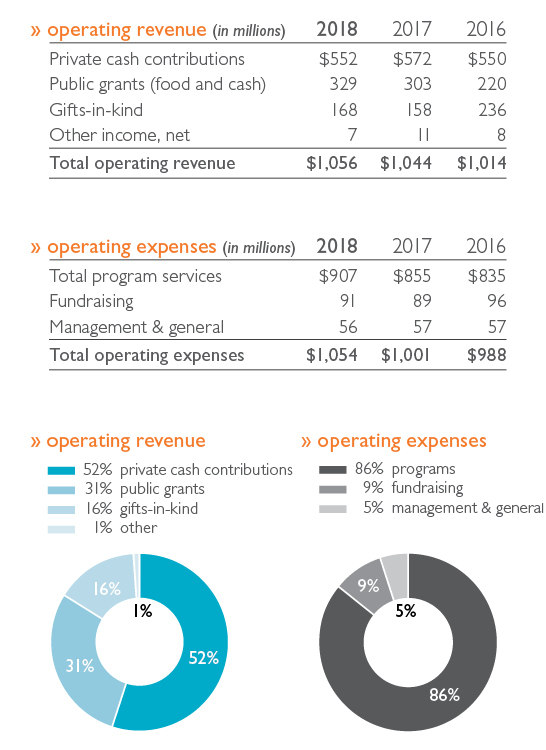 Fundraising, management, and general expenses (generally referred to as overhead) increased $1 million in 2018, but our overhead rate (overhead as a percent of operating revenue) remained at 14%. The overhead rate chart shows overhead as a percent of operating revenue.